27.01.2018 - The Ministry of Foreign Affairs condemns the opening of customs points in the occupied regions of Georgia, namely the opening of so called customs point in Akhalgori by Russian occupation regime and creation of so called specialized customs post in Sokhumi by the Russian Federation, which are aimed at integration of occupied Abkhazia and Tskhinvali regions within the customs sphere of the Russian Federation and represents another illegal step towards factual annexation of these regions by the Russian Federation. Alongside the opening of so called custom point in Akhalgori, bringing of meat and diary products from the rest of Georgia into the occupied Tskhinvali region was banned, which even more aggravates the dire humanitarian situation of the local population, restricts their freedom of movement and blatantly violates their fundamental rights. Against the background of building the barbed wire fences and other artificial barriers along the occupation line, closure of so called crossing points, and introduction of various discriminatory regulations aimed at restricting the freedom of movement, the opening of so called customs points represents a part of Moscow’s policy of integration of Abkhazia and Tskhinvali regions into Russia’s system, including the customs-economics sphere through implementation of so called treaties and isolation of these regions from the rest of Georgia. It is worth to note that with this kind of destructive actions the Russian Federation deliberately attempts to hamper the efforts of Georgia and international society for peaceful conflict resolution and engagement between the communities divided by the occupation line. 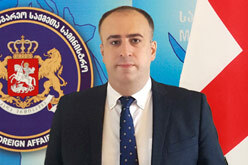 The Ministry of Foreign Affairs calls upon the Russian Federation to cease the provocative actions against the Georgian statehood, abide by its international commitments, de-occupy Georgia’s territories and take steps aimed at peaceful conflict resolution in accordance to the principles of international law. The Ministry of Foreign Affairs of Georgia appeals to the international community to give due assessment to Russia’s aggressive policy and take effective measures against the steps towards factual annexation of the territories of the sovereign state.